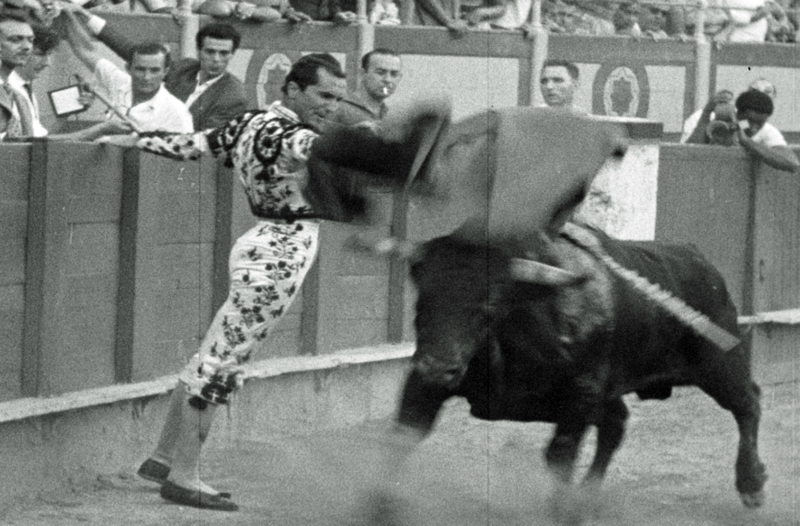 The old bullfighter, Luis Miguel Dominguin, was honored and safely in retirement when a new star appeared in the bull ring, the young bullfighter, Antonio Ordonez. A protégé of the writer Ernest Hemingway, Ordonez fought so brilliantly that Dominguin was challenged to come out of retirement and meet him in a mano-a-mano at Malaga. Producers Drew and Leacock used boom microphones and silent, wind-up film cameras to record the action in the ring. They hired local photographers and sound technicians to assist them in shooting from eight different angles. In this clip, you see Drew (in white shirt and tie) grab the mic from the technician and yank it out of the way of the fighter’s flowing cape. Drew later said that he feared the cape would wrap around the mic, leaving the fighter exposed to the potential of a deadly goring. And, yes, that’s Ernest Hemingway among the spectators. Jack Paar showed a version of this film on NBC’s Tonight Show in 1959. You can watch the film on snagfilms.com.